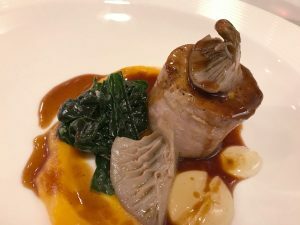 Our meal at Bibendum was quite an example of what a difference menu choices can make. Left to my own devices, I’d have probably given an unambiguously glowing review. But it was very clear that of the four of us I’d definitely made the best selections from the a la carte menu at Claude Bosi’s 2-star restaurant in the famous Michelin building. 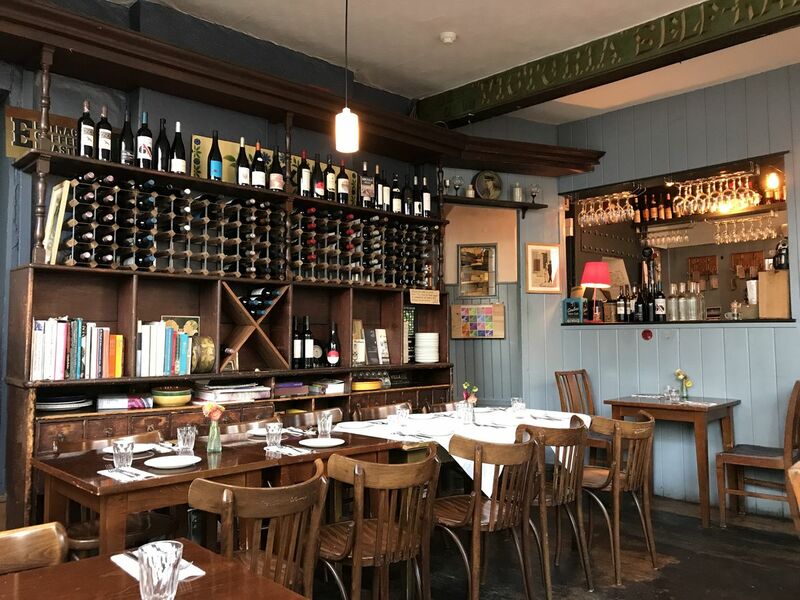 The dining room is iconic, with fantastic stained glass windows of the slightly bizarre cigar-puffing fat tyre man of Michelin, a towering ceiling overhead, and elegant chairs tucked beneath crisp tablecloths. The service was the kind of silk-smooth smiling efficiency you’d expect from a 2-star classic French establishment (though not faultless; our main courses arrived pretty much on the back of our starters being cleared, and then afterwards we were left completely untouched for almost 30 minutes; we felt a little like a table of ghosts, watching the world of fine dining bustling around us). There were some polite little amuse bouches. 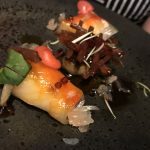 The liquorice-flavoured black sticky bun filled with salt cod was the stand-out specimen for originality and a flavour that lingered pleasantly with our wine. Tiny cone of foie gras icecream was meh. Though I freely confess to a huge “meh” on any attempt to chill foie gras. My starter was an absolute stunner, visually and in taste. Duck jelly, tiny cubes of smoked sturgeon, and a generous dollop of caviar. The jelly was clear as a bell and pure umami, giving a beautiful earth edge to the salty caviar. And this was definitely the most classically beautiful plate of food I’ve seen in a long time. 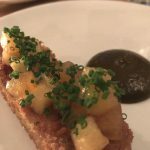 By complete contrast, Maureen’s pastry-coated sweetbread with pickled walnut jam was really quite an unrefined beast for such a refined table. Jolly good though. Tim’s golden beetroot terrine was a huge glowing amber brick of lovely beetroot with a smart mixture of blobs to add flavour pairings; the salty white feta especially good. Vanessa’s crab and apple I didn’t try; it was pronounced light yet unamazing. Well, I guess that’s the contrast. Refined French cooking of a classic French gave me mouth-gasms, while refined French cooking of a classic Asian dish sucked the joy out of it and left behind another “meh”. 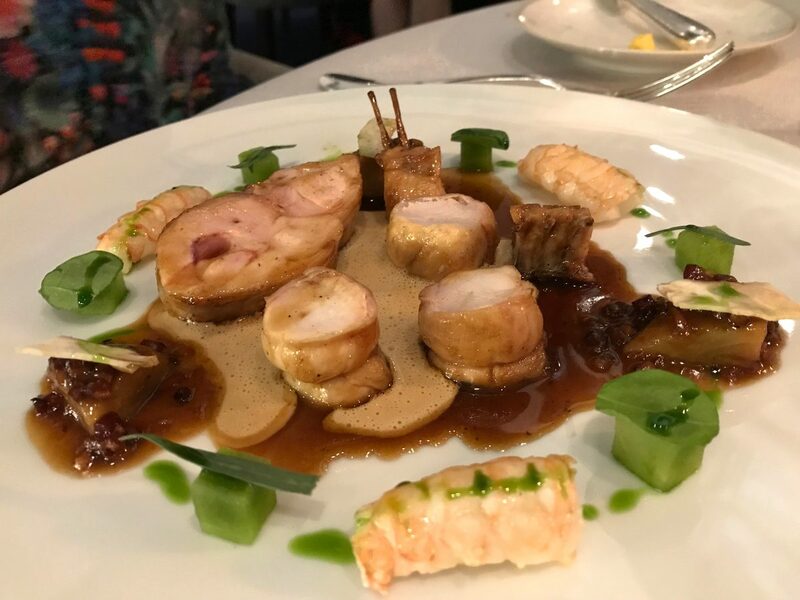 Tim’s rabbit and langoustine dish was very excellent, and Vanessa also partook of the lobster and found herself wishing for some other element to vie with the single-minded lobster. 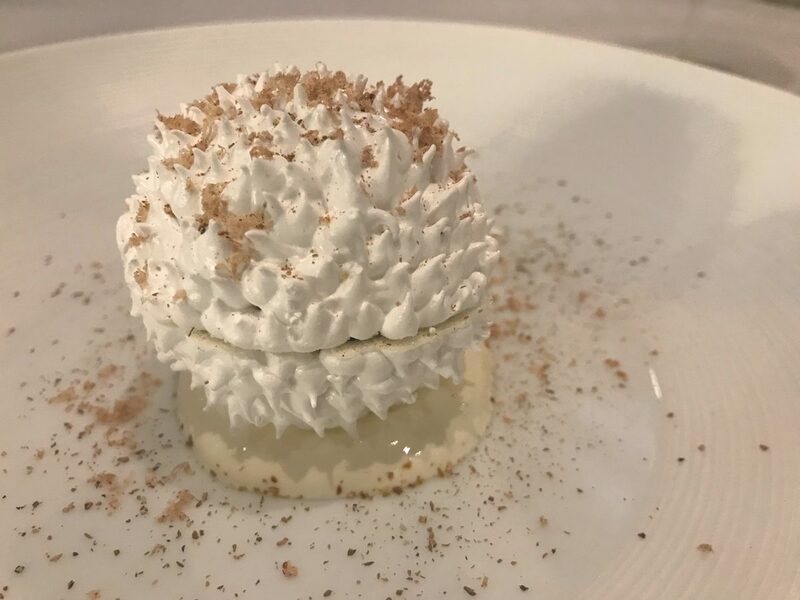 My dessert was a cep vacherin, which turned out to be a prickly golfball of pure white meringue filled with a delicate banana creme patissiere and sprinkled with cep powder. I enjoyed the novelty of the funky fungi flavour. All in all a good end. Others plumped for the chocolate souffle with Indonesian basil ice cream. This souffle was a monster, and the brush of shiny chocolate ganache over the perfectly raised surface was a good stroke. The ice cream cut the richness just enough. So… Bibendum. 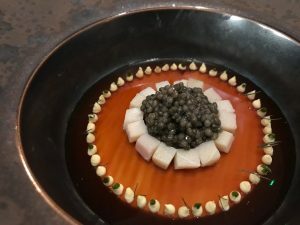 For £90 per head without drinks (and there are very few wine bottles under £60) you’re getting absolutely classic French fine dining. For the food alone, it’s not great value – though my own choices came close to brilliance. 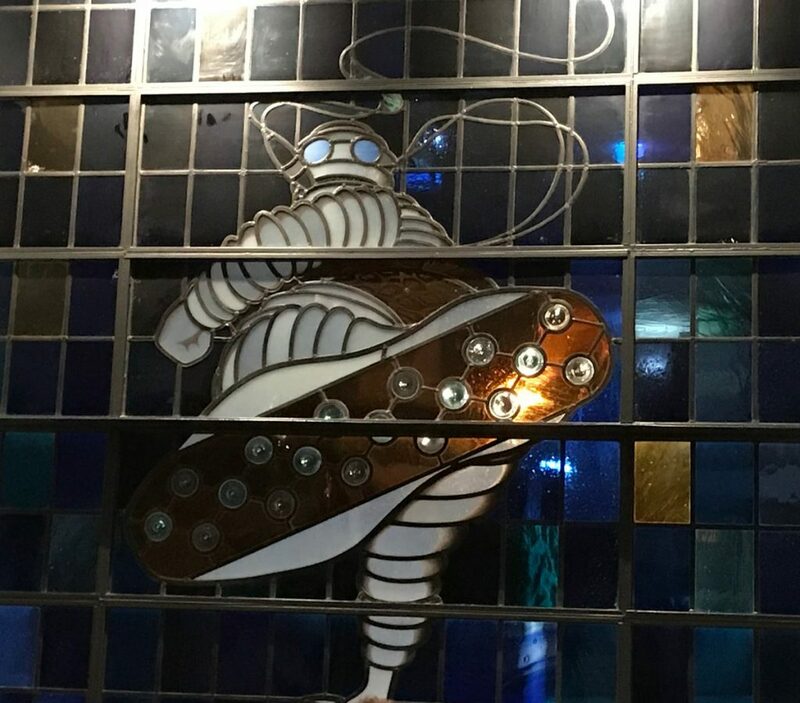 This is experience dining though, and you’re also paying for the crisp tablecloths, the effortlessly elegant waiters and good ol’ Bibendum with his fat cigar. Depends what you’re after. Nailsworth officially has a restaurant empire. 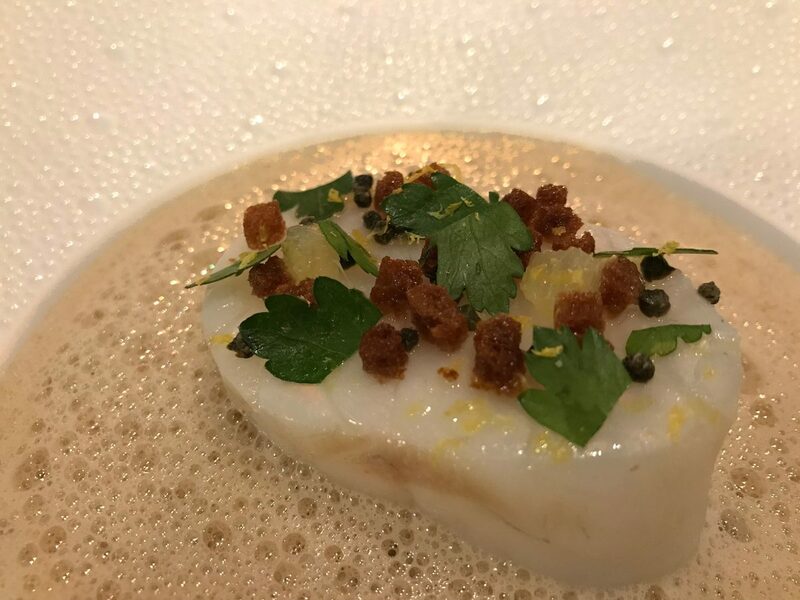 Just like Rick Stein in Padstow or Heston in Bray, chef Matthew Beardshall has now got no less than two… count ’em, two… restaurants in town! There’s the brilliant and relaxed Wild Garlic where we’ve always enjoyed great meals full of straight-forward good cooking, and now there’s Wilder which offers a higher-end tasting menu experience just a hundred yards down the road. 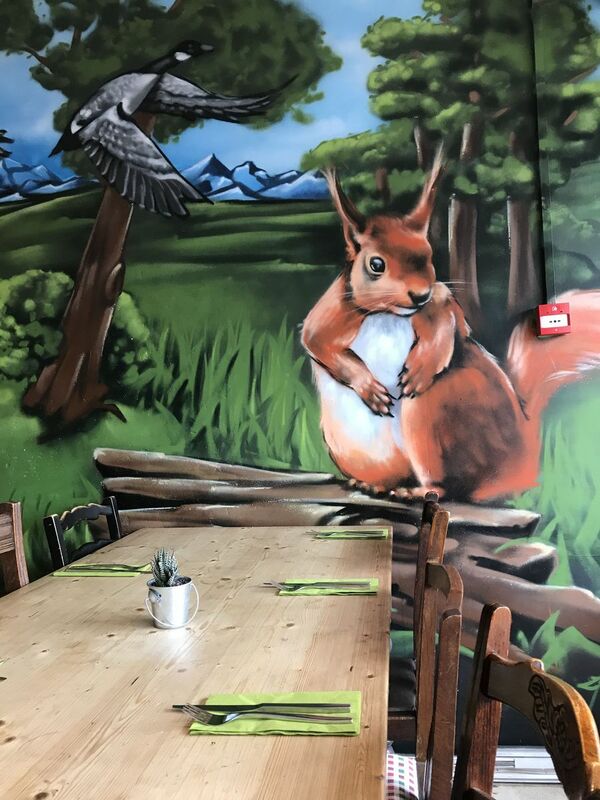 The menu is £70 for eight courses and, kinda like the Wild Garlic, the decor and the tableware doesn’t really flatter the menu. 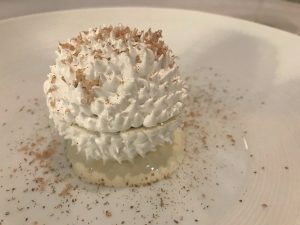 It’s pretty ordinary stuff and (I hate myself for saying this) ultimately I think some of the excitement and pleasure of an expensive tasting menu is where it’s served and what it’s served on. It might be that they’re planning on investing more when they know they’ve got a hit? Or that they just don’t have the touch for that aspect of dining. Still, they certainly know how to dish up good food! 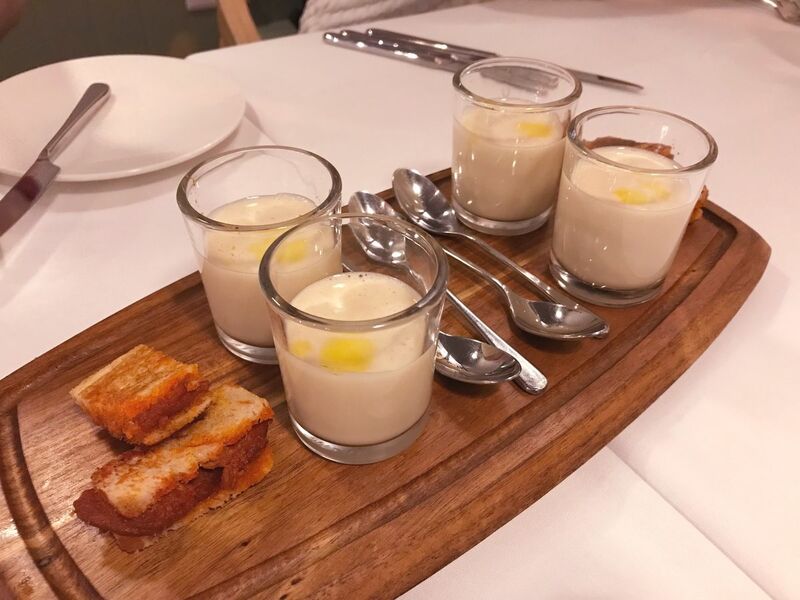 The first amuse was a cup of jacket potato soup. And that’s exactly what it was. Absolutely no mistaking the rough earthen flavour of a jacket potato coming through the smooth gulp of soup. Clever. Paired with a tiny sobrasada toastie that absolutely hummed with its own deeply earthy pig flavour. There were a trio of good starters with some neat ideas. Salt-baked parsnip with curd was lovely, the parsnip having a richly creamy texture to go with with its sweet/funk flavour. Home-cured salmon was delish, so was the roast and spiced cauliflower, though I wasn’t 100% certain the two really went together. Sweetcorn tortellini with a truffle emulsion made for another gently amiable dish, although the pasta was a bit thick; didn’t detract from the flavour at all, but I guess I had my “fine dining radar” on and this wasn’t refined. The main was a beautiful piece of pork tenderloin, still toothy and pink but nicely glazed without. The five-spice gravy was good, though subtle. Butternut puree, cavolo nero and a blob of transparent apple sauce accompanied well. The rest was a bit anti-climactic. 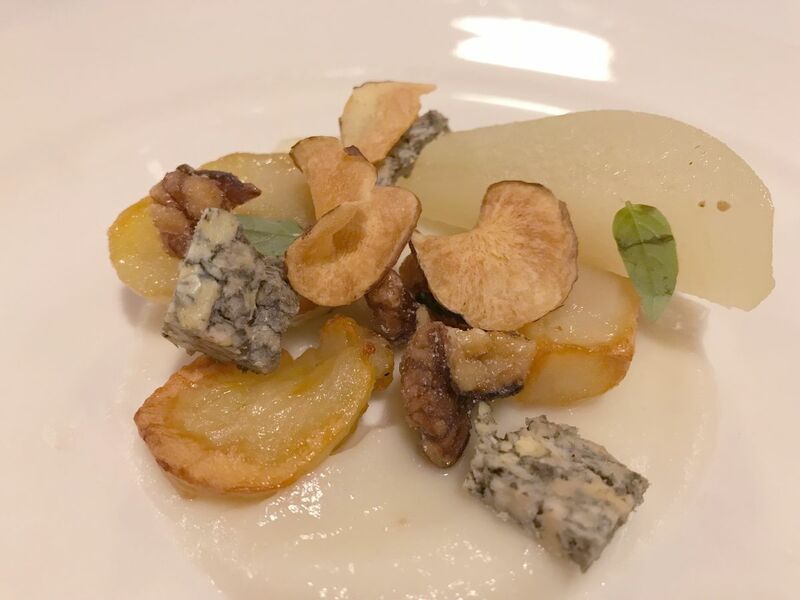 The cheese dish included a few nuggets of spicy Hampton Blue served with pickled pear plus roast, crisp and puree’d jerusalem artichoke. Creamy puree was just weird with cheese. The pear had lost its sweetness in the pickle. Pre-dessert of coconut sorbet with charred pineapple was better, though a very sweet sorbet indeed. Dessert was from the blob school of tasting menu desserts. A quenelle of (good) chocolate ganache, a quenelle of very sweet blackberry sorbet, and two dollops of chestnut mousse. I liked all three flavours in combination but this was a texture-free plate and after a few mouthfuls just too sweet and rich to love. The wine pairing was very reasonable and the wines very good and intelligently paired. Service was also lovely. 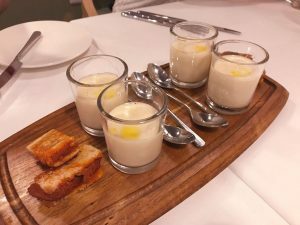 But really I’ve got: starters that I enjoyed but didn’t knock my socks off, a main course that was pleasant, and a disappointing pud. That’s not a great investment of £70 per head without drinks. 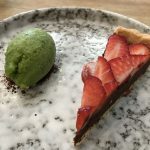 I’m going back to the Wild Garlic for an unfussy dinner I know I’ll love, and will wait quite a while before checking whether Wilder has turned up the volume on its tasting menu. Some twelve years ago we went on holiday to India, and the most abiding memory that I came away with was the pleasure of a nice cup of chai. A cup of chai while choosing spices in Jodhpur market. A cup of chai while haggling over hand-bound books in Udaipur. A cup of chai after dinner in a royal palace in Bikaner. A cup of chai in our transit hotel in Delhi after a fraught day of culture shock. So of course, it’s something I have always sought out back in the UK. Good chai is strong darjeeling tea with plenty of spices added, particularly cardamon, and the sheer strength is tempered with plenty of milk that has crucially been cooked along with the tea, and plenty of sugar. It is nigh impossible to find here. Even my beloved Chilli Pickle does a barely adequate chai, if I’m being really honest. 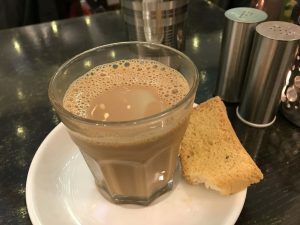 The chai at 3B’s (the abbreviated name of Bwyts Bwyd Bombai) flung me straight across twelve years and a few thousand miles back to a non-descript hotel in Delhi and a hot little cup of heaven. And it doesn’t stop there. 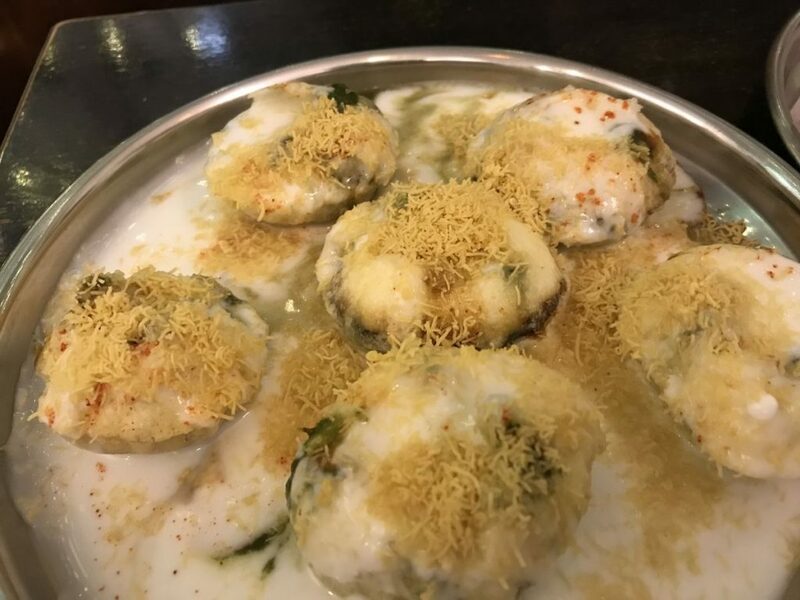 We had a plate of Dahi Puri, and although at first I thought they’d drowned the crisp little shells in yogurt, the sweet/sour taste of the chutneys mixed with the chickpea filling came warmly through. Next up was a samosa broken open and doused with chickpeas in a hot masala gravy, apparently a classic Bombay street dish (shouldn’t we be saying Mumbai these days?). 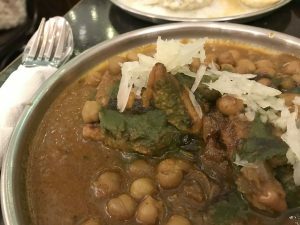 The masala gravy was divinely deep and warm-hearted, a cheap-and-cheerful match to the exquisite gravy I had with grouse at the Painted Heron a while back. Another street classic was the Batata Vada, a potato cake that was crisp on the outside and silky-soft within. 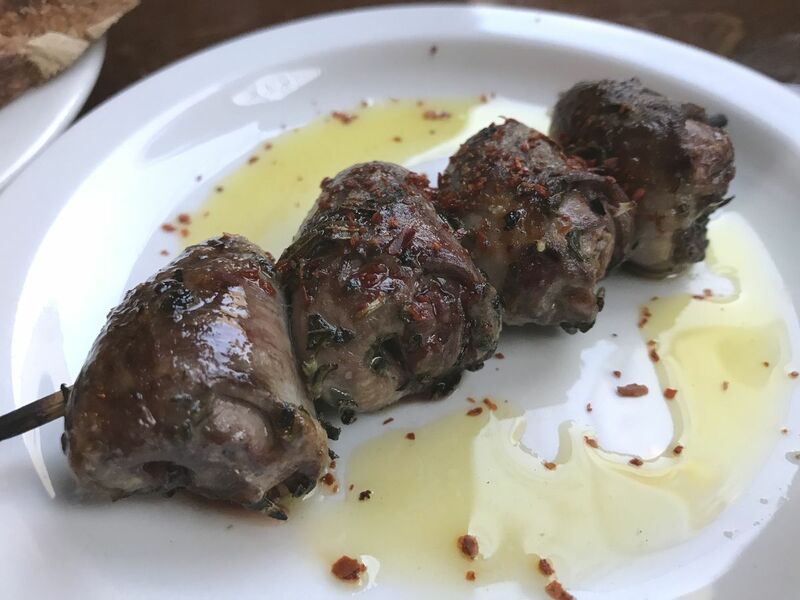 It was served with a powerfully roast-garlic flavoured powder and some astonishing chillies, frankly too powerful for anymore more than a nibble. For me, anyway. 3B’s never compromise authenticity, it seems. I could tell that the bright and fragrant mango lassi was made with the real fruit – it’s the huge noseful of fragrance that you get before even sipping it that gives it away. At £20 for two people to eat and drink enough for a good lunch, 3B’s is irresistible value. The decor and furnishing is very rough and ready which, y’know, basically just reinforces the honest authenticity of it. The chef here has clearly lived and loved a life with Bombay street food, knows how to cook it, and isn’t going to muck about with compromises for a “British palate”. Good on ’em. 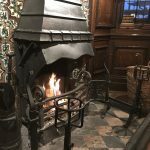 The Cauldron boasts of being the first entirely “solid fuelled kitchen in the last 100 years” – basically, they cook everything using wood or coal to “remove their reliance on the big 6 energy providers”. Don’t say it’s laudable. It’s not. If every restaurant in the UK switched to this approach we’d have lopped down the whole of the New Forest inside five years and there’d be new clouds of smog over every substantial city centre. That’s not really the point. The point is that it’s different, interesting, and provokes exactly these kind of discussions – generally, over lunch or dinner. It’s just as easy to pour scorn on hippies that choose to live in a forest commune, grow their own food and abandon the trappings of modernity. The world’s population is already way too large for pre-industrial ways of life to sustain everyone. But that those people exist, and choose to tell their stories in books and TV slots, is a very good thing because it provokes the right kind of conversations. The last thing we should do is sleepwalk our way into destroying the natural environment pole-to-pole and ourselves into the bargain. The Cauldron’s website looks way hip, so the hand-painted sign above a bow-windowed shopfront with a couple of pub tables outside in a down-at-heel parade of neighbourhood shops is a bit surprising. But the welcome is warm and they accommodate our unannounced arrival by perching us at one end of a long table booked for five. To our pleasure (but no doubt to The Cauldron’s chagrin), the five never show up. 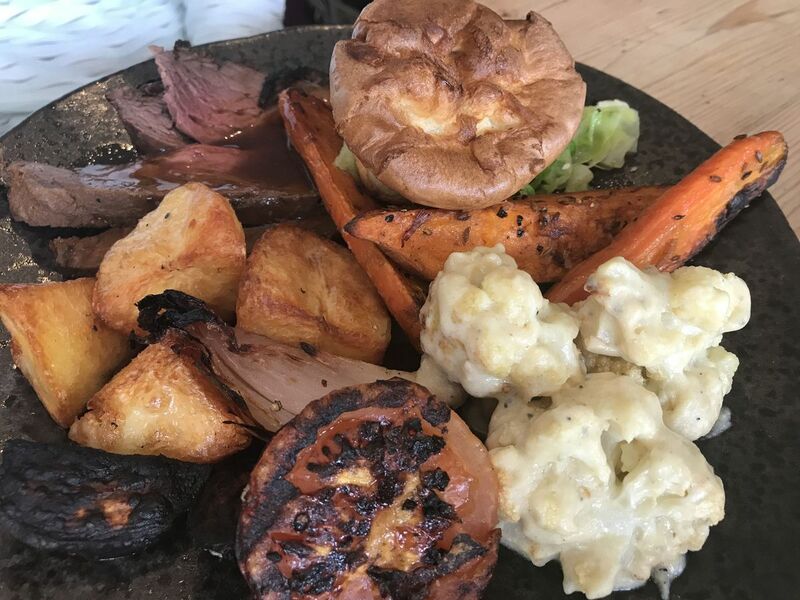 We are here for Sunday roast, and the plate that eventually settles before us is a smorgasbord of roasted things. I’ve chosen the mixed roast, so my plate includes roasted: beef, lamb, pork, potatoes, carrot, beetroot, banana shallot, sweet potato, yorkshire pud, cauliflower, greens and peas. The last three aren’t roasted but you get my drift! Love it. And I can report that all were roasted to perfection except for the carrot which was simply too huge to have cooked through and the pork which was drysabone. Outstanding was the beef: nicely pink sirloin, and it had been wood-smoked beforehand. If you like roast beef, you’ll love smoked roast beef! Also the beetroot, charred on the outside which gave it a coal-y sticky sweetness. Smashing cauliflower cheese – whatever cheese they chose, they chose wisely. The gravy was deep and good, but I should have asked for an extra boat as we just didn’t have quite enough. And, genuine or psychosomatic, I really thought I could taste the tang of wood-smoke right through the whole lot. And that’s your lot, we didn’t stop for pud. Decent glass of Rioja – all their wines are vegan, by the by. The roast was £15 and this is an excellent deal. 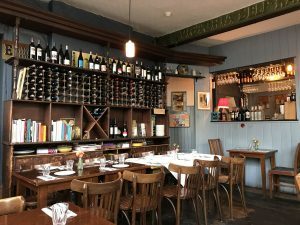 The Cauldron brings a dose of originality and some solid cooking to an already eclectic Bristol dining scene. I’m looking forward to going back on a not-Sunday and tucking into their regular menu. Bell’s Diner is a Bristol institution, it’s been there since 1976. And although it’s an entirely different team and a totally different menu these days, Bell’s is still 100% a neighbourhood bistro serving straight-forward dishes with continental inspiration. Maybe just leaning a bit more on Spain than France these days, most of the plates being tapas size and the inspiration coming from all around the Med. It’s cosy and eclectic within. The place wears its age proudly, the edges of the original woodwork softened by innumerable coats of paint. Drink menus come bound between the covers of classic 70’s albums. That sorta thing. You can’t not feel relaxed here. So we just ordered a mixture of half-a-dozen plates and waited to see what came. 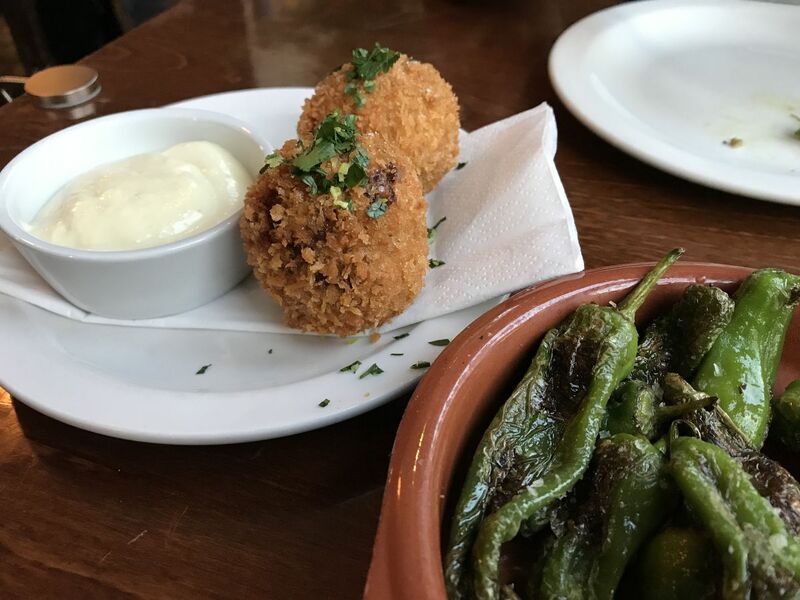 Padron peppers were good, obviously. And then we were served two nice big ox cheek croquettes, which really set the bar. Wow. Meltingly soft shreds of insanely beefy cheek in a sticky gravy hidden in a perfect ball of crunchy breadcrumb. I’ll take ten! Oh. Except then a neat skewer of four duck hearts appears, and these little chaps have been grilled to perfection; smoke-kissed taste on the outside, lovely rose pink softness within. I’ll take ten of those too! Next up was a generous plate of lightly dressed tomatoes with locally made ricotta and pangritata, beautiful combo although if I’m picky the toms were still a bit cold. Oh! Mustn’t forget their bread – a lovely twangy sourdough with the most amazing crisp and blackened crust on ‘im. There’s a lot of star-studded restaurants couldn’t turn out bread this good. The one slightly bum dish was a beetroot salad with cashel blue beignets. These little nuggets were jolly good. But the salt-baked beetroot had taken on just a leeeetle too much salt in the process. 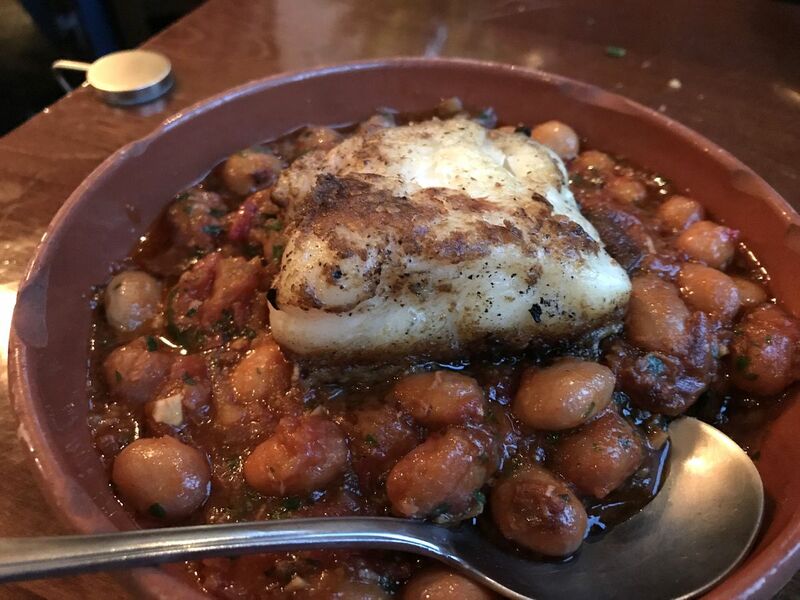 Any grumbles were cast aside by our final dish, a roasted piece of salt cod with a stew of borlotti beans and sweet pepper. The cod was perfect, the beans were fat, and the peppers had been cooked down into a stewy sauce that was nothing short of jammy in its sweet stickiness. The pairing of the salt cod and jammy stew: abject bliss. Didn’t have room for pud, which sounded a shame based on the noises from nearby tables. Best of all, the bill came down to about £17 each without drinks (and a couple of jolly good glasses of wine for very little). 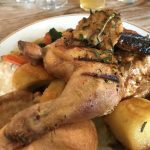 Bell’s Diner is the absolute epitome of local bistro: great price, great food, relaxed surroundings, and a menu that rotates enough that you could visit monthly and never get bored.